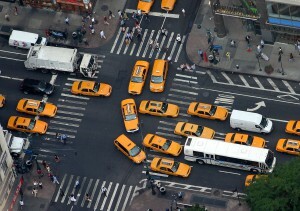 They say of New York City that "Nobody ever drives, there!" Why not? "Because there's too much traffic!" of course. True, most lifelong New Yorkers choose to take subways, cabs, buses and bicycles in order to get where they're going, but if you find yourself in NY state and you need to get behind the wheel, you're going to be a lot better off learning the rules of the road than you will be cracking wise. Here are three things that you need to know about driving in NY. You can get away with this in a lot of states, but New York isn't one of them. If you find yourself at a red light, don't turn right under any circumstance. Just wait for the light to change. There are some areas where you're actually not allowed to turn left during certain hours of the day. When you're in New York, always, always read the signs. You never know what weird law you're violating if you ignore them. "But I was nowhere near it?!" doesn't hold up in court. Always stay at least fifteen feet away from fire hydrants and crosswalks. It's really hard to find parking in New York City, so if you see a sweet spot that everyone's just passing up, it's probably because they don't want to get towed, so plan ahead for parking and keep some cash on hand to pay for a spot.